Nature Deficit Disorder! Really? There has been so much great conversation in the press the last several years about the value of kids getting outside more often and I love the conversations it has sparked. Do I think we need another set of letters to throw around describing behaviors that worry us as parents? No, not really. I love taking people climbing, often for me those days are more rewarding than sending a new route from my personal tick list, I suppose that is one reason I enjoy my work with Fox Mountain Guides. The interactions between family members while out climbing are one of my favorite aspects of this work. Watching a child belay a parent and seeing the parent trust that child when they take a fall or get lowered down from a high ledge is inspiring for me. Siblings pushing one another and building each other up to tackle a harder climb or give the crux one more try are other moments always grand to witness. When young people engage in climbing I believe that some amazing things can happen. A concept in psychology that often gets discussed is Internal versus External Locus of Control. Being too rigidly entrenched on either side is likely bad for a person but in general we find that people who have a healthy sense of Internal Locus of Control handle life’s challenges a bit better. This concept states that if I believe that my actions have meaning and consequences in a logical and predictable manner that I am more likely to make choices that lead to better outcomes. That may mean studying hard to pass a test, practicing driving skills, or having the confidence to ask that special person out on a date. In climbing we learn how to apply our bodies to gain height up a section of rock or ice and we discover that applying good technique leads to improved outcomes. 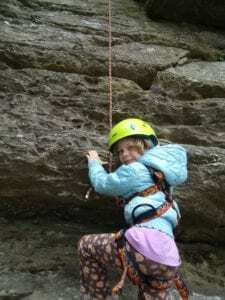 Learning the craft of being a good belayer, anchor builder, or gear placement allows the individual to access increasingly greater challenges and rewards. The responsibility of holding the lifeline of another person is a visceral experience that can lead to tremendous gains in a person’s confidence. For me climbing seems to accommodate a wide range of personality types, there is plenty of adrenaline out there for the high sensation seekers if that is what one gravitates toward. For the more calculating pensive types the experience of unlocking the puzzle of an intricate sequence of movements or crafting a svelte belay station can be fantastic rewards. Something else I like about climbing is that you do not have to be in great physical shape to start with it. As a child I was overweight from too little exercise and too much junk food. I was fortunate enough to have a coach in Judo pull me aside one day and tell me as much. I knew that he was not being mean or cruel or making fun of me, just expressing concern. I started running at a track near my house and changed my diet. Right around this same time I discovered climbing and as a result I believe I discovered my true self. Climbing allowed me to have a purpose for good health that I could be passionate about, making exercise an act of joy versus something I “had to do”. Fall is upon us. This is the magic time for rock climbers when the cooler temps allow us to try hard projects and really go for it. I’m looking forward to watching many kids I know crush boulder problems that have long lingered on their tick list and get the red point on a lead climb they have been dreaming of all year. They will inspire me and I will train a little harder myself and maybe one or two of my goals will get checked off as well. All of this magic happens through climbing and these kids getting outside. I am so lucky to be a part of that. So if your child hasn’t tried climbing yet I certainly recommend you give it a try. Maybe they will love it or maybe it will just be a really cool experience that gives them a boost in confidence, either way I think you will find that getting outside together as a family can lead to some great memories and some great conversations. Be well and I hope to see you out on the rocks or trails.